Terrorist gunman opens fire at Hizme checkpoint at the northern edge of Jerusalem. One victim hospitalized in serious condition. 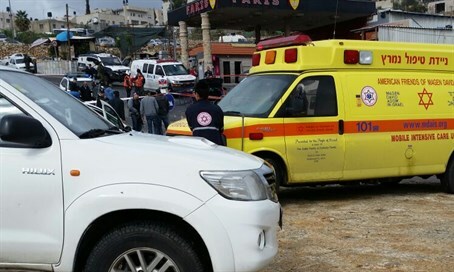 Two Israelis have been wounded in a shooting attack at Hizme checkpoint in north Jerusalem. Magen Davod Adom provided first aid to the victims at the scene, before evacuating them to hospital. One, a 47-year-old man, suffered serious injuries to his upper body, while a second, 20-year-old man was lightly injured. The terrorist opened fire towards the checkpoint from the Arab village of Hizme, and was eliminated at the scene by IDF return fire. Hizme checkpoint is currently closed to traffic in both directions as security forces secure the scene. Overnight, IDF forces continued their counterterrorism operations in the Samaria region north of the capital. In Shechem, IDf engineers supported by forces from the Egoz infantry unit demolished the home of Rajab Ahmed Mohammed Aliwa, who masterminded the double-murder of Rabbi Eitam and Naama Henkin in front of their four children on October 1. Aliwa recruited the other cell members and coordinated the preparations and the attack itself, as well as providing the murder weapons. The home demolition - part of ongoing punitive and deterrent measures enacted by the government to combat the current wave of Arab terror - came two weeks after the Hamas cell members responsible for the murders were indicted in Samaria Military Court. According to the indictment, the terrorists actually planned to kidnap the rabbi and his wife, but executed them on the spot when they resisted.